The question I am most frequently asked is “Why does my infused water taste bitter?” Without a doubt, your water tastes bitter because of the rind or peel on citrus fruits. And the longer you leave fruit to infuse, the more the bitter it will taste because the acidic flavors of the rind also infuse into your water. However, it’s really easy to solve this problem by cutting the rind off! I’m going to use a lemon in this tutorial, but the following applies to all citrus. 1. Cut off each end of the lemon. 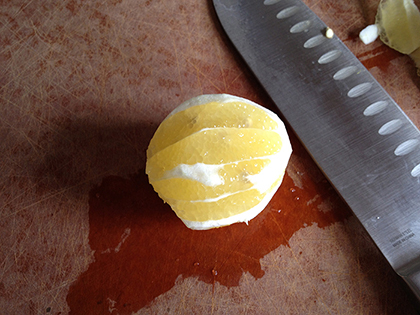 Having both ends of the lemon be flat will help stabilize it for the next step. 2. 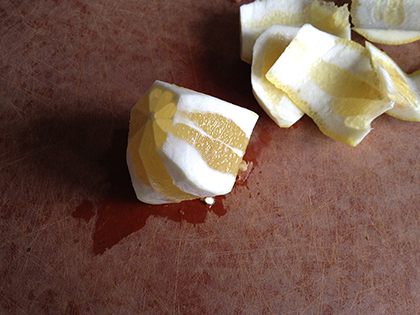 Angle your knife and cut away the rind in a arc-shaped motion. 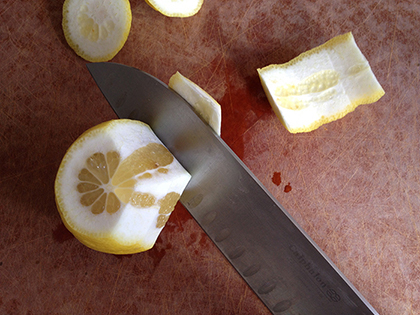 Unless you have the knife skills of a surgeon, it’s okay if you slice out some of the lemon flesh. 3. Continue cutting all around the lemon. 4. 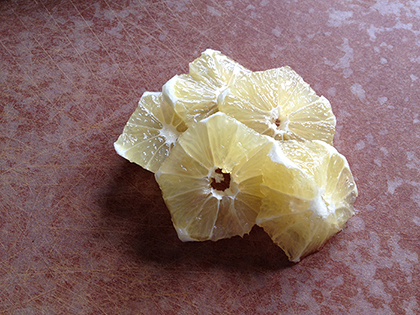 The pith (white part) of the lemon can also taste bitter, so you can also cut most of the pith away, too, until you have a beautiful, juicy lemon core. 5. 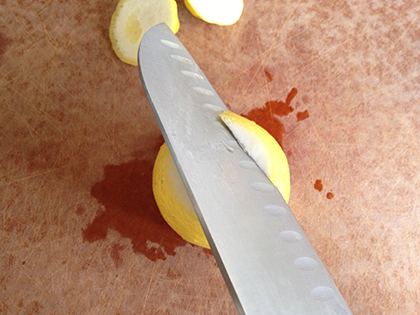 Slice the lemon into rough chunks, being careful not to squeeze too hard at any point as the lemon is very juicy. 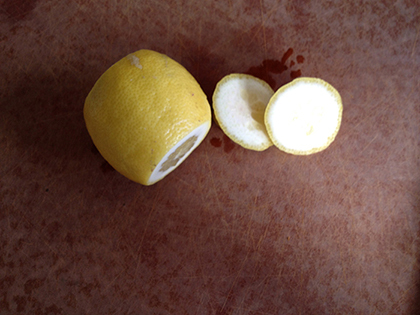 This lemon is now ready to be added to your infused water recipes and enjoyed for its sweet, bitter-free flavor. This works out so much better, I make my waters on Sundays & Wednesdays because I don’t have enough time during the week to make each time. Besides now I make waters for two others on the job, we are giving up soda together. I’ve been making infused water for a while now and i cannot tell you how much better it is this way! This small change was just what I needed to take this to the next level. Hello and thank you for the nice comment – all the way from Indonesia! I’m glad you are enjoying infused waters. They really helped me to improve my hydration and health. If you have any questions, feel free to post here. Hi, I’m from Indonesia too. Your blog inspired me. I have questions. I don’t like the bitter taste of the white lemon rind, but do they have benefit? Is it really oK not to use them? Hi, thanks for the tip about cutting off the peeling—actually I was looking for information about leaving the peeling on but afraid of chemicals that may be in the peeling becoming part of the water! Any ideas on that? I love to leave the peeling on because it looks beautiful and often encourages my family to try it out! Thanks so much for your recipes and encouragement! Happy New Year! Mix 3 parts water to 1 part white vinegar (3:1) in a spray bottle. Spray the solution on fruits or veggies. Wait 30 seconds or, better yet, scrub with a fruit/vegetable scrubber, and rinse with cold water. If you have a lot of fruits to wash, fill a large bowl of water with .25 cup of white vinegar and let your fruits soak for 10 minutes. Then rinse them with cold water. You will ned to buy organic lemons. Be prepared to pay some money and be careful about leaving the slices in the water too long. Organic lemons have very strong tasting bitter peeling. I have to say that I am inlove with your blog. I am a homeschooling mom and I am always looking for healthy, no sugar drinks for me and my kids. This fits into our life style perfectly. I have even turned my mom who is a health coach onto your site. We are thinking about implementing this into her practice. I do have question about the rind, I have heard that there are benefits to the rind in your water because of the oils in the rind. Is this something you have heard of? I really don’t mind the taste but was wondering what you thought. Thank you for your blog, we love it. Hello, J’Nessa, and thanks so much for the great question positive feedback! There are indeed oils in citrus rinds, especially oranges. However, they are not readily released through the process of infusion. Extracting the oils requires more dramatic methods, such as distillation and use of solvents; Wikipedia has a great article about essential oils made from fruit. While the oils in the fruit rinds may contain health benefits, you will get more nutritional content from the fruit juice that leaches out while infusing. If you are seeking even more vitamins, you can always juice or make smoothies. The main benefit of infused waters is superior (and tasty) hydration, followed by the awareness that you are consuming natural, healthy flavors from fresh fruit. I hope that answers your question. Please feel free to write anytime! The rinds do contin bioflavanoids (sic). I do not know how much dissolve into the water. I certainly do not like peeling and would only eat them if starving. Hi Amy, thanks for the tip. I’ve just started with GM diet and paired it with lime infused water, just that i noticed it’s getting bitter thought of removing the skin would help but it didn’t, but now thanks to your blog i can infuse lime/citrus fruits longer.. more power..
I’m new in this. Just recently try the infused lemon water to alkalize my body and replace sweet drinks. I just use 1 lemon cut into 5 slices for a bottle of 1.5 liters of water and keep it in the refrigerator. Can I recycle the lemon slices and for how many times? And how do lemon water can alkalize my body? I thought lemon is acidic? I am new to infused water and I appreciate this tip greatly! Here’s a tip for anyone else reading…after you “peel” the lemon, drop the rind in your garbage disposal and run it with hot water. It freshens the disposal and leaves your kitchen smelling great. If you have orange peels, boil them with some cinnamon or nutmeg then let them simmer….another great smell for the home! thanks Amy for ur tips. no wonder my infused water was bitter. Hi Amy! Great blog of yours! I am new in consuming infused water so there’re like lots of question in my mind. Can we actually re use the fruits? Like refilling them with water. Also how to know if we need to refrigerated it or just let it sit on room temperature? Thanks! By taking the rind off the fruits your losing alot of nutrients that are really important. To counteract the bitter flavors I have choosen to add a few drops of pineapple juice. Outside restaurants serve with skin on, but why aren’t they taste bitter? Is there some skill to learn? Why wouldn’t I just squeeze lemon juice in the water, what’s the advantage here? My husband’s aunt introduced me to infused water and now I can’t get enough of it. I even went out and bought an infusion and when I do up a pitcher I fill up a empty soda bottle and put it in the freezer and take it to work..
Hi, just a suggestion. I actually keep the fruits I intend to infuse with in the freezer. It stays for longer. And having them frozen helps a lot with the cutting off the peels. The fruit doesn’t get squishy and no juice gets wasted away. lol wish I saw this before i made my first batch of infused water last night. Ive added honey to bury the bitter taste for the time being but I will know better next time! Hi, I would like to ask that with the rind is actually good or bad? Base on benefit for our health. Suggest with rind or without is better for us? Can we using alkaline water to do infused water? Hi.. If i refrigerate the infused water overnite, next day should i filter the water or its ok to keep it infused. Also if its ok to keep it infused then till how long can we keep it infused? The way I have my water is I first boil the water add two or three bags of green tea in a liter jug, and pour the hot water in the jug. I let it cool down to luke warm, then I add one sliced lemon with the peel on ( do wash the peel in vinegar water and rinse it again )and refrigerate it. Tastes great and I am also getting the benefit of the green tea. Try it, good for you, and good luck! I usually mix lemon water with turmeric ginger powder for greater taster and health benefits. You just need to try it. Thanks a lot ! I have been struggling for weeks to get the bitter out of the lemons. Then I got hold of you. Walla ! I am going to try right away, and will also try the tip of green tea added ! Hi.. I am running a restaurant here in Jakarta, Indonesia. I am planning to launch few new menus. one of them is the infused water itself. 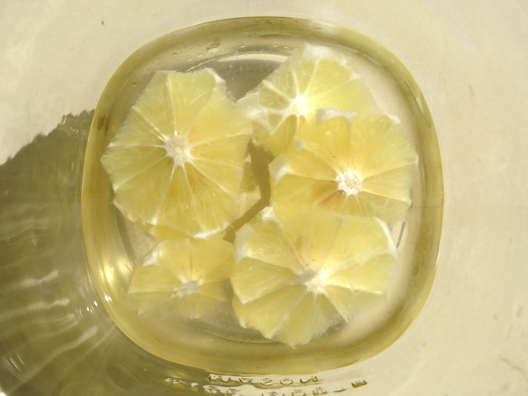 It is true that the the longer we leave the citrus fruits in water, the stronger bitter taste will come up. Your idea is great for sure, but the looks of the citrus fruits without the the rind will be so ugly (not presentable), especially we serve it in a glass. In there any other ideas where we can remove the bitter taste without cutting off the rind? Thanks a lot..
Oh thank you!!! I thought it just meant my lemons went bad. I leave my slices in all day and keep refilling but sometimes it’ll taste bitter and I won’t drink it anymore. I will definitely be trying this!! I tried doing this one, but my lemon water still tastes bitter. What can be the problem? …add a pinch of baking soda, stir then try again. This is so informative. Thanks a lot. Been trying to find out how to ensure the infused water does not have the bitter taste. Keep up the good job. Is the benefits still the same even if i removed the skin of the lemon? Anyways, I am trying it now and the taste is so much better. Thank you for your tips!